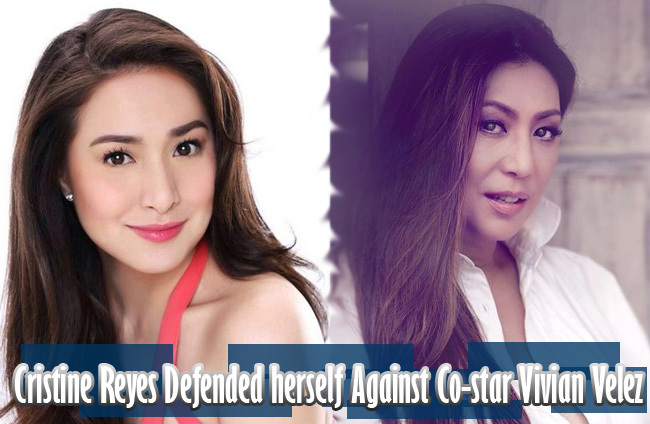 After Vivian Velez ranted on Facebook about being humiliated and upset by an actress which was later on named to be Cristine Reyes, the latter finally released a statement regarding the issue. Cristine told PEP via interview that she has high regards to the senior artists therefore will not do such a thing. According to the production team of 'Tubig at Langis', it was all misunderstanding. The ire between the two actresses started when Vivian shared a dressing room with Cristine but was eventually booted out. The veteran actress was insulted even more when she overheard Cristine singing Avril Lavigne's 'Goodbye' and thought that the song was meant for her. In an interview with TV Patrol, Velez said that she never did anything bad to Cristine to deserve such treatment. Cristine and 'Tubig at Langis' shared the same statement that it was not Cristine who asked for Vivian's transfer that aggravated the latter. Based on reports, Cristine's original dressing room was infested with mosquitoes reason for her to request for a transfer to avoid dengue or such. The production immediately addressed her request and moved her in the master bedroom [in the set] which became her dressing room. Eventually, Vivian's dressing room was being fixed so the staff asked Cristine if she can share the room with Vivian and according to Cristine, she agreed to. But since Vivian's room was already done, Vivian was asked to vacate Cristine's. Contrary to Vivian's accusation that Cristine had shouted at her and booted her out. The 'Tubig at Langis' production staff defended Cristine and clarified that it was them who decided to transfer Vivian back to her own room since it was already done. They also said that Cristine has heen working pretty fine along with her co-stars and staff until this incident. The production staff apologized for the misunderstanding. However, Velez still stood by her irrevocable decision to quit the afternoon show 'Tubig at Langis' that started last February.